You know that dish, that one dish you make that you never ever need a recipe for? The dish that your friends tell everyone about? The dish that, once you’re finished cooking it, you gaze down upon with a satisfied grin knowing everything is right with the world? 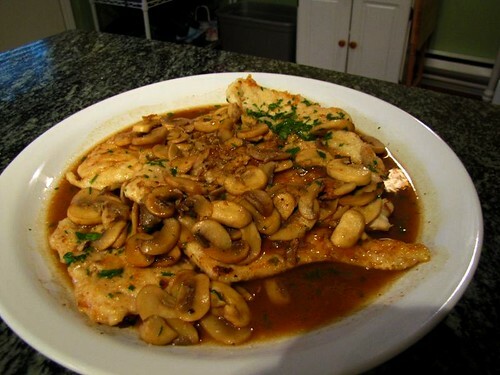 Chicken Marsala is that dish for me. I made it for the first time quite a few years ago, for my mom’s birthday. It was my first real meal cooking for my parents and I wanted to make something…a little less ‘pedestrian’ than chicken Caciattore or Parmigiana. She had some nameless Italian cookbook at the time and I picked the Marsala recipe because it looked quick and easy yet still impressive enough for a ‘fancy’ home dinner. Over time I’ve changed the way I make it, but it’s a fairly simple dish and the basics are still covered. 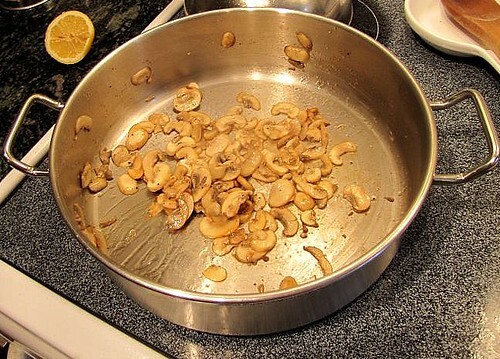 Clean off the mushrooms with a damp paper towel. Remove stems and slice thin. Melt 1 TB of butter in a stainless steel (not non-stick) pan over medium heat. 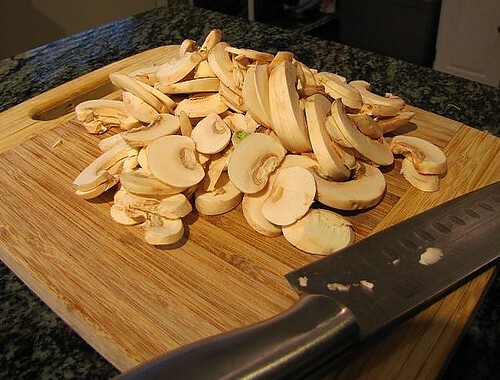 Add 2TB of olive oil and the sliced mushrooms. Cook until browned, about 7-8 minutes. Add 1Tb lemon juice. Sprinkle with salt and pepper, just to taste. Remove from pan. 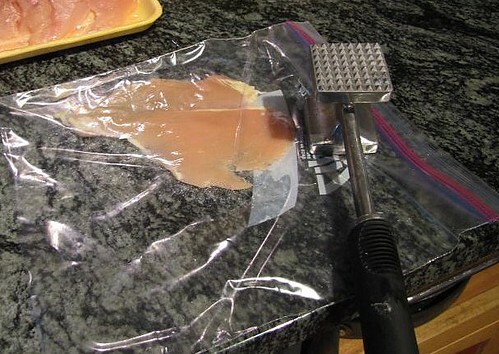 While mushrooms are cooking, pound out the chicken breasts one at a time in a zip top bag. Dredge in flour seasoned with salt and pepper and set aside. 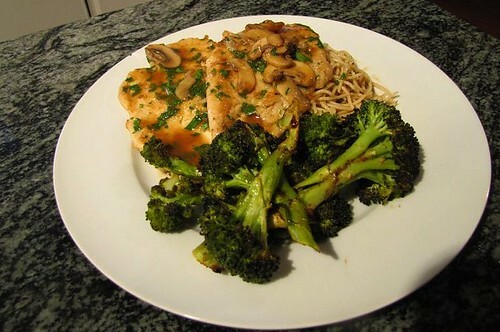 When the mushrooms are finished cooking, add the remaining 2TB of olive oil and cook the chicken, approximately 3-4 minutes on both sides, until slightly browned and cooked through. 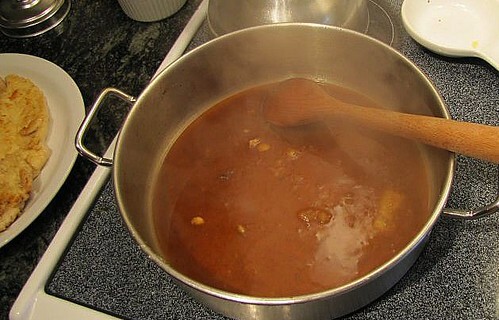 Add Marsala to the pan and de-glaze, scraping up all the browned pieces at the bottom of the pan for flavor. Allow the wine to cook down for approximately 3-4 minutes and add remaining 1 TB of butter. 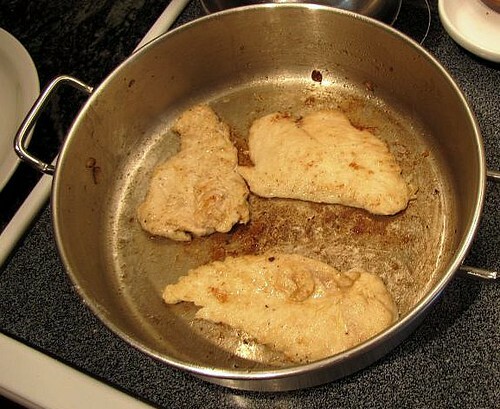 Return mushrooms and chicken to the pan to reheat. Add remaining lemon juice and parsley and serve. Unf. So simple, so flavorful. My favorite recipe, and most likely the one that helped me realize my love of cooking. I served it over whole wheat spaghetti tossed with lemon, olive oil, fresh parsley, parmesan cheese, and salt and pepper; also a side of roasted broccoli. I'm curious… where did you get that pan from? Is it made by Cuisinart? I have an weird obsession with pots and pans among other kitchen gadgets and I just love that one you have. Hi Shai! I love that pan, too – it's fantastic for searing, and with the high sides it holds a ton of food. It's not by Cuisinart, though — I purchased it a few years ago at my local Wegmans (regional food store), and unfortunately they don't have their cookware for sale online. Here's Cuisinart's version: http://www.cooking.com/products/shprodde.asp?SKU=564762Thanks for stopping by!